I was one of the lucky Qypers to be invited to a “Chess and Chutney” event recently at Mooli’s. I admit to having little if any interest in chess, but what really got me through the door was my curiosity to find out what the fuss at Mooli's was all about. Another reason why I like going to these events is to get a more personal perspective of a restaurant business. In this age of e-mails, text messaging and twitter, it is not difficult to forget that behind every restaurant or small business, people like you and me are investing their all to bring us something they feel passionate about. So, I was pleased to meet the two faces behind Mooli’s – Sam and Matthew. 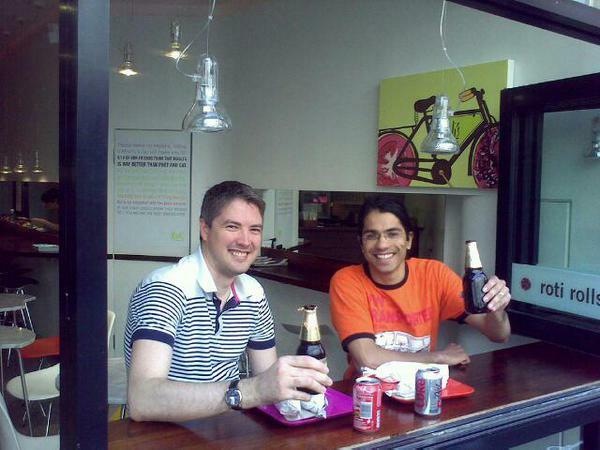 Two former City workers, they quit their 9-to-5 jobs to pursue their dream of opening a restaurant where healthy, good and delicious Indian street food could be enjoyed in the heart of London. Talking to Mat, I found out he lived in Sao Paulo, my hometown, and speaks perfect Brazilian Portuguese! But what is a mooli? In the words of the founding partners: “Mooli /’mu:li/ n. 1. Warm flavoursome fillings, zesty salsas, vibrant chutneys & crunchy salad, all rolled in a freshly homemade roti”. I would struggle to give a better description for these “wraps” – the roti is thin and fresh, holding a generous portion of meat and vegetables, and is accompanied by one of the homemade chutneys or salsas. My first experiences of rotis were in Malaysia (roti canai), Southern Thailand (roti paratha) and Singapore (roti prata) where these are served with sliced bananas and condensed milk and sometimes with a fried egg for a savoury version. In India and Pakistan, rotis are part of nearly every meal and is usually eaten with curries and cooked vegetables. On London’s Frith Street, you will find five different types of regular moolis + one special (goat and potatoes) which are prepared by the head chef and mooli master Raju. We were shown around their kitchen and introduced to the process of mooli making, and the preparation of the accompanying chutneys by Raju. Of the many chutneys and salsas, my favourite was the one made of mint, coriander, apple and ginger – it was delicious, fresh and perfect with my goat mooli. It only took Sam 39 attempts to crack the perfect recipe for this chutney! I also tried the beef option with crunch coconut, salsa and raita which was equally delicious. The decor is also pleasing – the room is uncluttered, trendy but with a casual and relaxed feel. I was very pleased to have been introduced to Mooli’s, Sam and Matthew, and would like to thank Eamon of Qype for organising another great event and for inviting me along. Cost: the two moolis I tried were complimentary. All moolis are priced well under £5 each. Likes: delicious moolis (the goat mooli is fantastic), very affordable food and drink menus, excellent central location and personal, friendly service. Dislikes: a City branch is URGENTLY needed (preferably between St Paul’s and Bank, pls!). 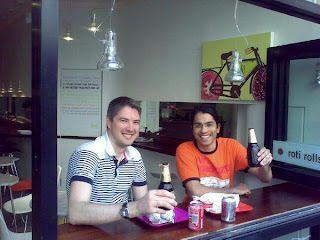 Verdict: delicious, fresh and very affordable Indian street food (Rotis) in great central location. Well priced drinks menu, and a most delightful place for a bite to eat and a nice chilled beer. Another great addition to the London food scene. Highly recommended. I've tried both vegetarian moolis and they're both really tasty too. This has become quite a regular lunch stop for me. Sounds scrumptious! I'll have to pop in and give it a try next time I'm strolling around Soho. @thewellingtons - Thanks Ian, it was great meeting you and Rej there too! @ Natasha - interesting, I haven't yet tried the vegetarian ones, I should give them a try, thanks for letting me know! @ Sofia - Thanks Sofia, nice to hear that you enjoy my reviews! Voce e' brasileira? Pode escrever em portugues se quizer! Me mande noticias. Que legal ter meus compatriotas lendo o meu blog! @ Mr Truffles - thanks mate, it is always nice to hear from you! Do you get to go to Soho a lot? I seem to go less frequently now that I live in Islington, I used to spend all my time there as a student. But whenever I am in Soho I drop by Mooli's. Luiz, fazer reviews nao é bem a minha especialidade mas obrigada pelo convite. that was such a fun afternoon wasn't it? Lovely write up Luiz! @ Sofia - tambem nao e' a minha (trabalho num banco)! Tenho certeza que existem muitos restaurantes portugueses que sao excelentes, alguma sugestao? Luiz, restaurantes portugueses só conheco O Cantinho de Portugal e o Bar Estrela em Stockwell. A comida é melhor no Cantinho, o Bar Estrela á mais para ir ver futebol. Vou enviar mail para combinarmos.